Jared Unzipped: What Does The Destruction of hitchBot Say About America? 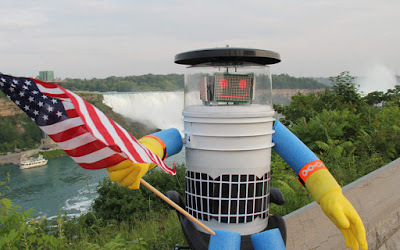 What Does The Destruction of hitchBot Say About America? Leave it to us Americans to screw up something wholesome and innocent. The sad news broke this week about hitchBot, a roving talking robot, being destroyed in Philadelphia, Pennsylvania. Created by two Canadian University academics named Frauke Zeller and David Smith, hitchBot was designed to travel by hitchhiking and perform as a friendly companion to drivers. It began its journey in Halifax, Nova Scotia and successfully hitchhiked all the way to Victoria, British Columbia -- over 6,200 miles in all. Travelers would pick hitchBot up alongside the road, whom would then proceed to talk with the drivers. hitchBot did not have functioning limbs, so strangers were required to literally pick him up. Thankfully, hitchBot was made from a small electronic dome head attached to a bucket, with swimming noodles for arms and legs -- he was fairly light. For a face, hitchBot employed a simple LED screen that would smile and wink. It had a somewhat complex conversational vocabulary and could discuss all sorts of things. The robot would also snap a photo every so often to record its trip. Using the hashtag #hitchBot, those whom picked him up could share their adventures for all the world to see on the internet. hitchBot attended a wedding, went to a dance and even had its portrait painted. After traveling across the entire breadth of Canada, it then hitchhiked successfully through a large swathe of Europe without incident. The amount of miles hitchBot logged without encountering a problem is astounding -- this speaks to the inherent good nature of most Canadians and Europeans. hitchBot survived a measly two weeks in the United States. The talkative robot launched its trip in Massachusetts on July 17, 2015. It saw a baseball game and made a swing through New York City. By August 1, it had arrived in Philadelphia. There, it was vandalized and left in a ditch to proverbially die by an unknown assailant. I realize this was just a social experiment to see how humans will respond to a hapless, innocent robot, but I fear this reflects how vicious many Americans truly are. An object with no means of defense traveled a long ways without being vandalized, only to be destroyed within a few weeks here in the good ol' US of A. What does this say about Americans? Are we barbaric? Dangerous? Not to be trusted? First the murder of Cecil the Lion, and now hitchBot... all in the span of a week. If the obliteration of hitchBot proves anything, it's that Americans are masters of death and destruction. When Unlimited Data Doesn't Mean Unlimited Data. Social Media And Idiots: A Dangerous Combination. Why Does New Orleans Still Exist? (Extra) Large And In Charge. My Top Six Favorite Generation II Pokémon. More Than Just A Game. What Not Being Quite So Fat Has Taught Me. You Can Pick And Choose Your Family. Let's Talk About Passing Gas. New Methods Of Marketing Pumpkin Spice To Women. Southern Cooking Will Kill You. Thanks For Eleven Great Years! I Have The Lungs Of A 51 Year Old Man. I Need Your Computer Advice.